I bought my BFG Rival S 1.5 (225/45/15) toward end of last season to replace my worn out RE-71 from 2016 season. 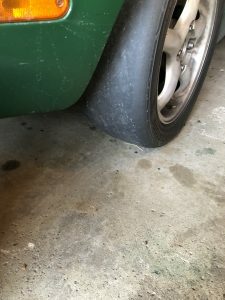 It still has a good amount of tread left, but I quickly found out that it is not my type of tires… I’m not saying it is a bad tires, nor slow tires. They are plenty fast, and in right driver’s hand, they’ll perform as fast if not faster than Bridgestone RE-71R. However, RE-71R is more suited to my driving style and to my preference. I like the tires that talk to me, and have good feedback when they are at their limit. BFG has very high limit, but felt a bit dull in terms of feedback at its limit. It does take much more aggressive driving, and probably the actual limit of the grip maybe higher than the RE-71R (Especially being 225). 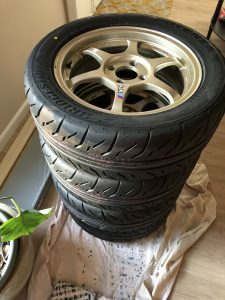 However, for me, without knowing where that limit exactly is, I could not push the tires and thus could not fell in love with them like the way I did with my RE-71R at first sight (or first driving to be exact…). Since my spare set of tires (that I use for semi Daily/Rental autocross) was worn all the way down to Hoosier, I figured I probably should go back to my trusted RE-71R and use the BFG as my spare set. worn out all the way down. almost no tread left, but as long as it’s on dry surface, it still got amazing grip! Thanks for Team Watermelon and the friend “D”, I got my new set mounted to the super light SSR Type-C.
By the way, I truly mean Thank you, especially the friend “D”. First of all, he showed amazing skill of mounting and balancing a set of tires in less than 10 min, and even more amazing is that he only used 0.50oz of weight on one wheel. that’s it! He balanced other 3 perfectly without any weight on the wheel! Surprisingly 225/50/15 BFG and 205/50/15 RE-71R supposedly the same weight of 21LB. Also the wheel that they are mounted on is very close in weight; BFG on CE28 15×6 +45 which is 8.49lb, and RE-71R on SSR 15×6 +38 which is 8.40lb. the only weight difference would be the spacer I use. CE28 needed 12mm spacer to maximize the tread width with in my class regulation, but SSR only needs 5mm. I’m not good enough to be able to tell such a small weight different, so it will give me a good chance to drive brand new RE-71R and almost new (stored indoor in plastic bag over the winter) BFG side by side some event to see how much difference does those two tires, similar in performance, but with different feel to the driver, would result me in autocross settings. So now, all I need is a beautiful nice warm day on 04/22 weekend! !